Feta Spinach Stuffed Mushrooms are the perfect party appetizer or side dish. Mushrooms stuffed with spinach, garlic, & feta cheese. 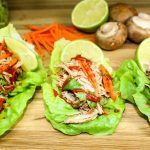 Weight Watchers friendly recipe- 1 SmartPoints! Entertaining and hosting people is my favorite hobby. That’s right, I’m going to call it a hobby! I really enjoy making dip/appetizers, having people over, playing games, and having fun. Probably the main reason I enjoy this so much is because I really LOVE making dips and bite sized foods. Everyone loves dips and bite size food! It’s a great way to try a bunch of different foods without having to make a full dinner for guests. 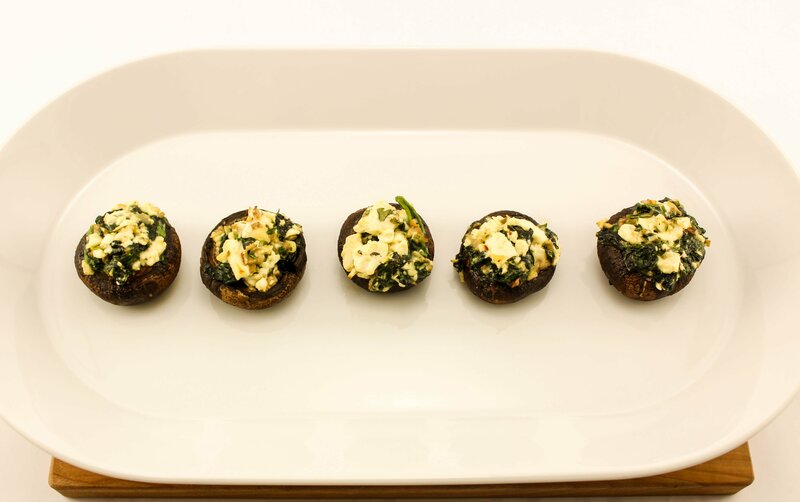 My Feta Spinach Stuffed Mushrooms are a great appetizer to serve at a get together, or for a side dish to any main meal. This is a Weight Watchers friendly recipe and one mushrooms is only 1 SmartPoint!! I love to eat anything that is “stuffed”. Peppers, potatoes, meat, you name it. Mushrooms are a great vessel for stuffing because they hold the ingredients in so well. I got the inspiration for these stuffed mushrooms because my neighborhood grocery store sells already made spinach and mozzarella stuffed mushrooms. I figured I would make them myself, but substituted feta for mozzarella because I always have feta on hand and it’s my favorite cheese. You really could use any cheese you want! These are very easy to make and don’t require a bunch of dishes to use. Just pop off the stems of the mushrooms and make the stuffing! For the stuffing, I chop up the stems of the mushrooms (they are great and shouldn’t go to waste! ), sauté some baby spinach, and mix those ingredients with chopped parsley, chopped garlic, and feta cheese. To add a little heat, sprinkle in some red pepper flakes. Once the stuffing ingredients are mixed, pile the stuffing on top of each mushroom and gently press to make sure they are really stuffed. The mushrooms will bake for about 20 minutes. You can totally make these ahead because they taste good hot or at room temperature. Feta Spinach Stuffed Mushrooms are bursting with garlic and feta, so good! 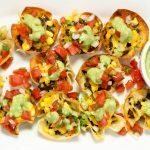 These are the perfect appetizer for your next party OR even as a side dish (which I will say that I serve these as a side dish often). Your guests will be impressed with these small bites! I hope you enjoy these small bites of flavor! Gently remove stems from mushrooms and set aside in a bowl. Spray baking sheet with non-fat cooking spray and lay mushrooms flat with open side up. Finely dice parsley and garlic. Add ingredients to the bowl of diced mushroom caps. In a skillet, sauté spinach until wilted. Mix mushroom caps, sautéed spinach, parsley, garlic, and feta cheese. Scoop spinach mixture and fill each mushroom. Drizzle mushrooms with ½ tablespoon olive oil. Bake for 20 minutes until mushrooms are golden brown.